What makes a system for getting out of debt and staying out of debt work? There are so many sites focused on this task, so many good ideas abound. Yet, are you living a pleasant financial life? Your heart is in the right place, you certainly want to do the right things around money, but it has not worked out that way. At least, not yet. You try every new thing that comes along in hopes that this is the final, magic solution. Then, you despair because, once again, it has not worked for you for long. And you may be in worse shape now than before you followed the program. Just like a diet. Chronic money problems start early in life, and get aggravated by later life experiences. The complexity of the issue is too much for most normal people. No one book or TV show or webinar, budget, spreadsheet or counselor will cure what ails you. Sorry. So what do you do? Throw in the towel? Give up and wallow in debt as long as you can get away with it, or live in deprivation until you scream for relief? Nah. What you need are the easy practical tools, and the help of a spiritual source, call it what you will, which this website can give you. Wait! Don’t hit the exit button. This is not a religious site. There are no set dogma, prayers, outfits or holidays. Sorry about the last one. But there will be gifts, things you never expected, surprising money miracles, wonderful coincidences. That is the spiritual side working. This is a balance of practical and spiritual. At this point in your life, it’s what you need. Name your spiritual helper: God, Hashem, Love, Jesus, Bhudda, Allah, Nature, Love, or even Reality for those of you who have trouble with the spiritual concept. Clear, unadorned reality can be a wiser guide around your money than you’ve been lately. Agreed? The practical plus the spiritual is a combination that is so powerful. 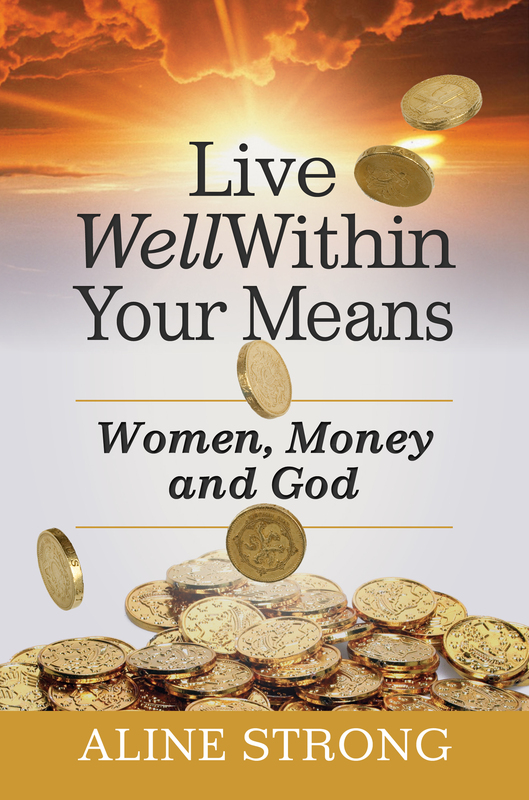 My book, Live Well within Your Means: Women, Money and God, lays out an easy-to-follow process for you to deal with the practical aspects of finances to achieve peace and prosperity. Along with that, it surrounds you with the promise of spiritual strength to maintain these practical tools, for lasting results. Live Well within Your Means:Women, Money and God guides you to a comfortable money life where your needs, your wants, and especially your dreams are funded. Live WellWithin Your Means: Women, Money and God is available for sale at amazon and smashwords.